This is the common base class for (stream) encryption using GnuTLS. Definition at line 44 of file tlsgnutlsbase.h. 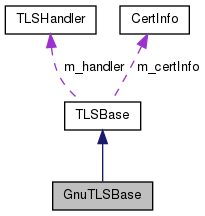 const std::string & server = ""
Definition at line 27 of file tlsgnutlsbase.cpp. Definition at line 33 of file tlsgnutlsbase.cpp. Reimplemented in GnuTLSClient, GnuTLSClientAnon, and GnuTLSServerAnon. Definition at line 88 of file tlsgnutlsbase.cpp. Definition at line 61 of file tlsgnutlsbase.cpp. Definition at line 42 of file tlsgnutlsbase.cpp. Definition at line 106 of file tlsgnutlsbase.cpp. Definition at line 72 of file tlsgnutlsbase.h. Definition at line 75 of file tlsgnutlsbase.h.